I've gone and done it again. Signed up for something with little to no knowledge of what I'm doing. 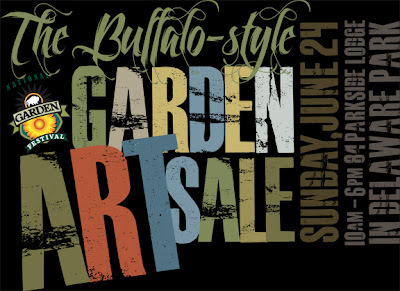 I signed up to participate, as a vendor in the upcoming Buffalo-style Garden Art Sale. I get a ten-by-ten booth to sell garden art, or garden-inspired products to rabid gardeners. It's being held during the Parkside Garden Tour, so we're sure to have a good-sized built-in crowd. Inspiration from a Mexican bathroom. And I've never done anything like this before. So I've been experimenting. 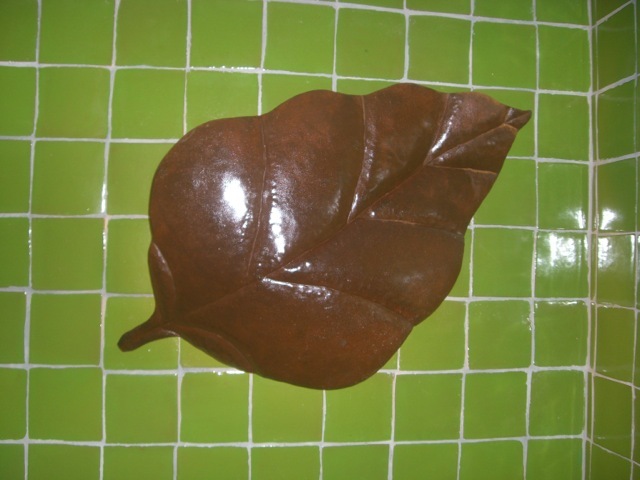 Friends in Mexico have this awesome copper, over-sized, back-lit leaf in their guest bathroom. 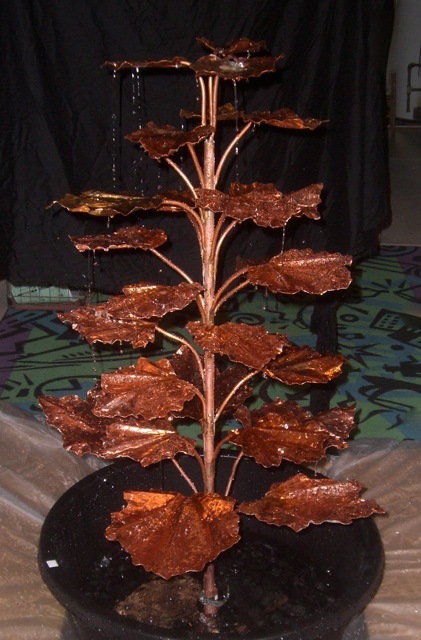 I had been working on my homemade copper coral bell fountain and was getting used to working with the copper (not so swift with the soldering skills yet). 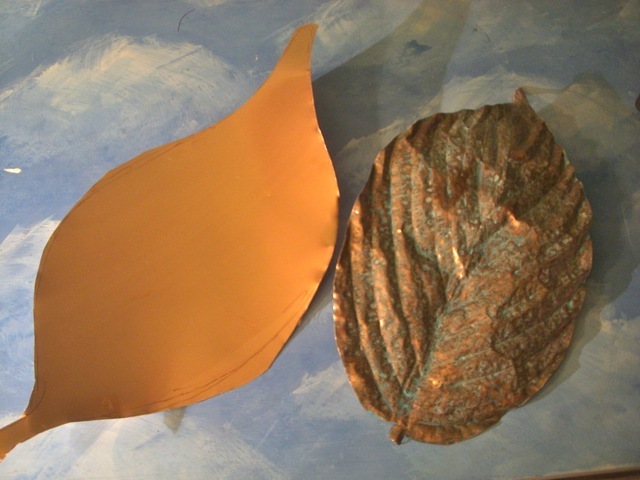 I figured I can cut something out in the shape of a leaf and pound the hell out of it. So I did. I've made three so far. I'll probably end up with eight or nine of them. 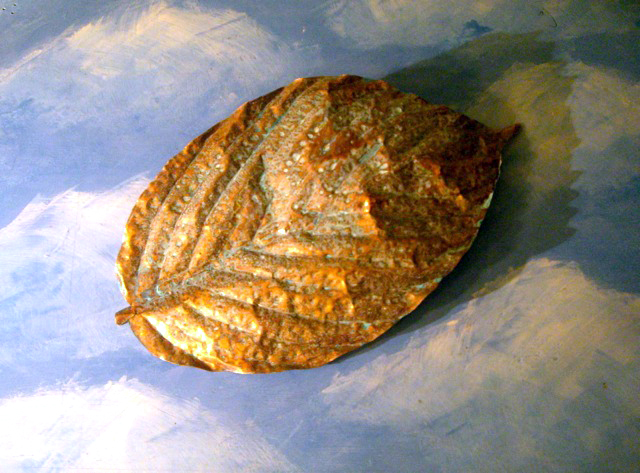 I plan on buying lights for the backs of them, I just have to figure out how to put some "legs" on the back of the leaf to hold it out a bit from a wall to accommodate the light. I intend these to hang outdoors, on a house or garage wall visible from a deck or patio. They're each 2'x14", give or take. There's also a Hosta Society Show being held at the Garden Art Sale that day. 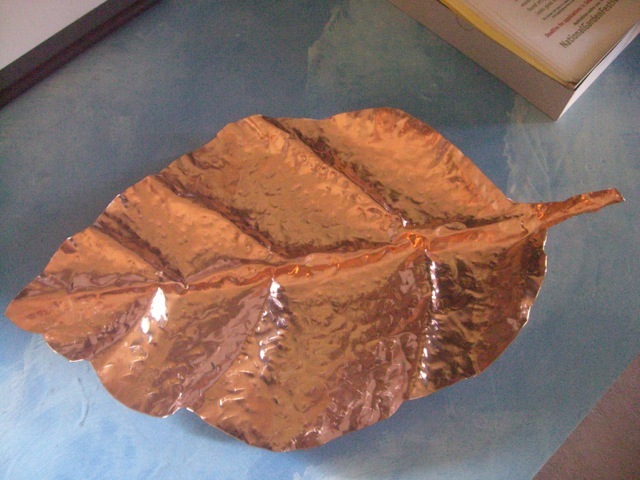 Knowing my audience, I'm going to make mostly hosta-leaf-looking pieces. Target marketing? Pandering? We'll see. I spend my weekends now getting hammered. I'm also learning that getting the verdigris patina is like a grade-school science project - though it requires great restraint and patience, things grade schoolers don't have in large supply. First you clean the leaf really well to rid it of fingerprints. Then you give it a light, but solid, coat of Windex window cleaner. Then a light spray of a mixture of ammonia, salt and vinegar. And then cover it for 24 hours. It's practically a salad dressing! This is where the restraint comes in. The less used the better I'm learning. But the effect is cool (and smelly). I'll give them all a coat of a sealant to retard any further weathering. This is the label I designed. bottle torches I have on my own deck. 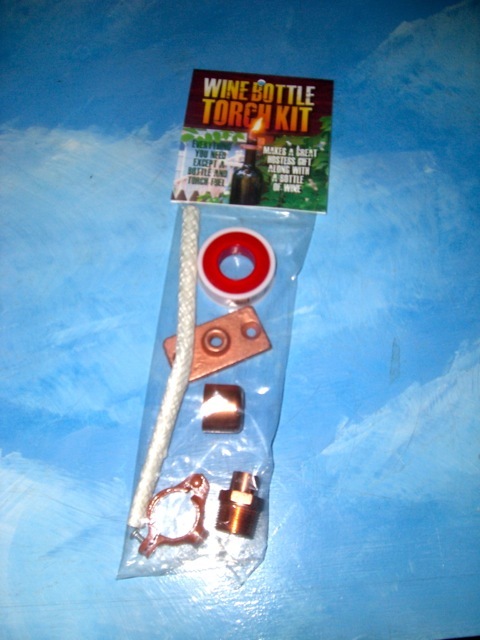 I'll also be selling these Wine Bottle Torch Kits I'm putting together. I made my own a few years ago for my deck and really liked them. It takes just a bunch of plumbing parts - and just a few minutes of time. Everyone that's seen them says they want do the same thing - but no one ever does. 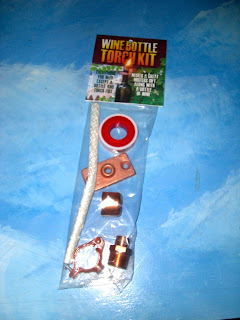 So I figured a kit would give people the incentive to actually reuse/repurpose a wine bottle this way. In our case, my daughter and I had to do something with all mommy's empties. 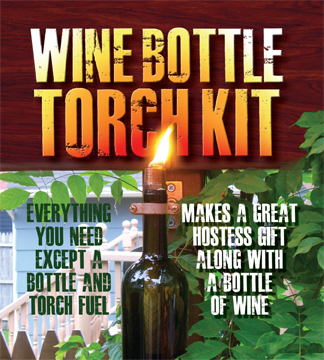 The only things not in the kit are the bottle and torch fuel. 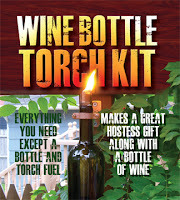 I think it makes a good "hostess" gift to show up to a summer party with this kit and a bottle of wine. At least that's what I'm counting on. I've ordered the parts and plastic bags and have done what is the most fun part for me - designed the label for the packaging. 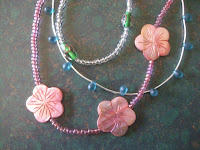 My daughter also makes glass bead necklaces and sells them whenever she has the chance. I'm on the committee organizing the event and wasn't excited about having jewelry designers as part of a "garden art" sale, but in order to attract more vendors for this, our first year, we decided to accept garden- or botanically-themed art, including jewelry. I guess jewelry sells well at sales like these, and we'd be foolish to make a blanket decision to exclude anyone. She's been working furiously making flower-oriented and leaf-themed necklaces the last week or so. She'll have nearly 100 made by the time of the sale. I have a couple other ideas of things I'd like to make, if not for this sale, for my own use (damn Pinterest!). My only issue is time. Weekends are precious - there's gardening to do, family & friends to visit, and the ever-present client workload. The sale will be only one day - Sunday, June 24 from 9am-6pm. Mark your calendar, stop by and see what I ended up with. As soon as all vendors are confirmed, I'll publish them here. You're turning into a stark-raving capitalist, like your daughter!!! Love the way you are combining you and your daughter's creativity with you growing things. It makes total sense.